Where are the liberals on Venezuela? Reps. Tulsi Gabbard, Ilhan Omar and Ro Khanna are among the few liberal Democrats who unequivocally oppose the Trump administration’s economic and covert war against Venezuela, but they are isolated. House Speaker Nancy Pelosi and many other top Democrats support Trump’s plan. Senators Elizabeth Warren and Bernie Sanders and even Rep. Alexandria Ocasio-Cortez are on the fence. They oppose direct military intervention, but they accept the pretense is that the U.S. government is concerned about the democratic process in Venezuela. In fact the U.S. gets on very well with the governments much less democratic than Nicolas Maduro’s. Only the naive think the U.S. government is concerned about anything except Venezuela’s oil. I don’t have an intelligent opinion on how much of Venezuela’s plight current is due to bad policies of its government, and how much is due to continuing U.S. economic warfare and political subversion. The only way to find out would be to make the experiment of leaving Venezuela alone and seeing what happens. Venezuela is the responsibility of the Venezuelans. After the 9/11 attacks, almost the whole world proclaimed its solidarity with the United States, including leading Muslim clerics and pro-US sympathizers in Iran. This would have been a great opportunity for the United States to lead the world in suppressing Al Qaeda and other jihadist terrorists. Instead the George W. Bush administration chose to use the “war on terror” as an excuse to invade Iraq. The Obama administration actually armed jihadist terrorists to overthrow the governments of Libya and Syria. 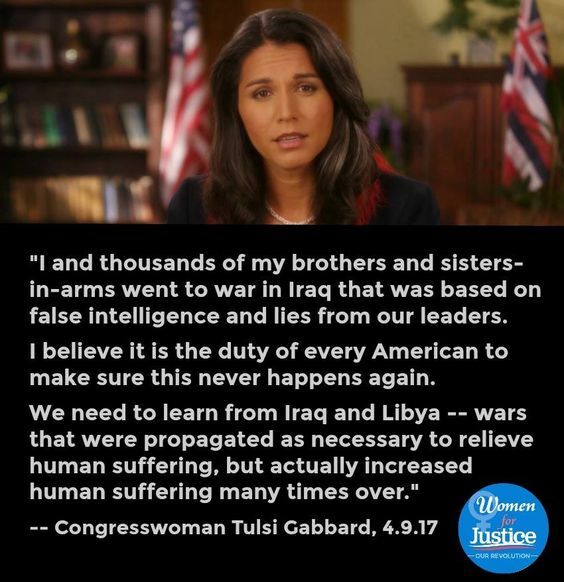 Rep. Tulsi Gabbard, a Democratic congresswoman from Hawaii and a long-shot candidate for President, wants to replace the bogus war on terror with a real war on terror. After serving with the U.S. military in Iraq, she concluded that intervention was a mistake. She opposed “regime change” proxy wars against Libya and Syria. She courageously questioned the official narrative about chemical weapons in Syria. After some misgivings, she endorsed the nuclear deal with Iran. She opposes U.S. support for the Saudi war on Yemen. She is not a peace candidate. She just wants to replace the bogus war on terror with a real one. She has praised President Assad of Syria for fighting the Islamic State (ISIS) and Al-Nusra (successors to Al Qaeda) fighters. She has praised President el-Sisi of Egypt for suppressing the Muslim Brotherhood. She is aligned with Prime Minister Narendra Modi of India, a radical authoritarian anti-Muslim nationalist. She favors drone warfare and continued Special Operations missions against terrorists. She has said that the root of terrorism is in “radical Islam” and criticized President Obama for his refusal to use that word. The Al Qaeda terrorists were in fact members of an extremist Muslim sect, the Wahhabis or Salafists, who are the established religion of Saudi Arabia. The Saudis have promoted their version of Islam all over the world, especially in Pakistan. This is true, but it is not the whole truth. Just being an extreme Muslim authoritarian doesn’t make you a terrorist. The reason terrorism has cut an appeal is the U.S. military presence in so many majority-Muslim lands, U.S. manipulation of so many majority-Muslim governments and the death and destruction caused by U.S. forces in so many Muslim lands. U.S. policy serves the interests of Saudi Arabia more than it does Americans. That’s because of a long-standing deal, going back to the 1970s, in which the Saudis agree to guarantee an oil supply, buy U.S. weapons and keep the oil profits in dollars in return for U.S. military support. Gabbard is right to oppose wars to serve Saudi interests. Her policy would be an improvement over Trump’s, Obama’s and George W. Bush’s. She is not a peace candidate, but right now she is closer to being one than any of other candidates I know about. At the same time, her policy is compatible with maintaining the Pentagon budget and the military contractor establishment in all its bloated glory. Killing terrorists, in and of itself, won’t end terrorism, any more than killing drug dealers will end drug addiction. Tulsi Gabbard and the Great Foreign Policy Realignment by James P. Pinkerton for The American Conservative. Tulsi Gabbard, controversial 2020 Democratic candidate, explained by Zack Beauchamp for Vox. Tulsi Gabbard Is Not Your Friend by Branko Marcetic for Jacobin. Rep. Tulsi Gabbard, a Democrat from Hawaii, is more of an anti-war candidate than Bernie Sanders, Elizabeth Warren or any other presidential candidate who has announced so far. She opposes “regime change wars” on principle, which no other high-profile politician has been willing to say since Rep. Ron Paul left Congress. Such wars, as she pointed out in the interview, have caused hundreds of thousands of deaths and enormous suffering to ordinary people in the Middle East and elsewhere without making Americans safer or better off. Ending regime change wars would be a big change for the better, but it wouldn’t necessarily mean giving up the U.S. empire of bases and cutting back the U.S. military mission to defense of the homeland and fulfilling treaty obligations to allies. If you really want to crush Al Qaeda’s successors and imitators, the first step would be to stop arming them to so as to bring about regime change. Most of the commentary on Gabbard’s announcement ignored all of this. Instead it focused on her opposition to gay rights moe than 15 years ago..
She is one of a number of people who was raised as a social conservative, and changed their minds over a period of years. I can understand this, because my own opinions, including on LGBT issues, have changed in the past 15 years. But some commentators think this will sink her campaign before it gets started. Gabbard comes from an unusual background. According to her Wikipedia page, her father is part Samoan and a Catholic; her mother is a convert to Hinduism. She was elected to the Hawaii state legislature at the age of 21, then was deployed to Iraq as a member of the Hawaii National Guard. She is now serving her fourth term in Congress. In 2016, she resigned from the Democratic National Committee in order to support Bernie Sanders’ campaign for president. I agree with everything she said in the Joe Rogan interview and most of her views as given on her Wikipedia page. My main concern about her is her praise of the authoritarian nationalist government of President Narendra Modi of India and her alignment with Hindu nationalists in the Indian-American community, which is reportedly a large source of her funding. I also object to her statement in a 2014 interview that torture may be justified under certain circumstances. Win or lose, she will force the Democrats to debate war and peace issues on a more fundamental level than before. Five Reasons I’m Excited About Tulsi Gabbard’s Candidacy by Caitlin Johnstone. Lots of good links with this. Tulsi Gabbard’s 2020 Campaign May Be Over Before It Starts by Ryan Bort for Rolling Stone. Tulsi Gabbard Is a Rising Progressive Star, Despite Her Ties to Hindu Nationalists by Soumya Shankar for The Intercept. Why her ties to right-wing Hindu nationalists are troubling. Tulsi Gabbard, congresswoman from Hawaii, is a dedicated surfer and accomplished athlete, a Hindu and vegetarian and a member of the National Guard who volunteered for service in Iraq. Not a typical background for an American politician! But in my opinion, she represents the future of the Democratic Party—if it has one. She understands something that most Democrats still do not, which is the futility of the 15-year U.S. policy of worldwide military intervention. She understands that the first step in fighting radical Islamic terrorism is to stop subsidizing terrorists. She acts on that understanding even though it is unpopular. I read a good article about Gabbard in The New Yorker online this morning. The things that the writer finds questionable about Gabbard’s record make her respect her even more. Right after the election, she met with President-elect Donald Trump to discuss foreign policy, and came away hopeful that he might adopt a less interventionist foreign policy. “Less hopeful now,” she is quoted as saying. She traveled to Syria in January to talk to President Bashir al-Assad about the possibility of ending the Syrian civil war. Click on Mike Whitney for a transcript of this interview. Can you trust your dentist? Did Assange go stir-crazy in embassy? How socialist is Bernie Sanders? Is there a real peace candidate in the race? Who are willing to fight for their countries?